Paddle Out Productions deploys recently purchased WPM line arrays and SX218 subs with iKON 81 amplifiers for events in Southwick, Massachusetts. The Garden Grove Festival in Southwick, Massachusetts received an audio upgrade courtesy of new Martin AudioWPM loudspeakers, provided by Paddle Out Productions. Burhans first became aware of Martin Audio with a CDD-LIVE rig supplied by long time Martin Audio partner, Mark Waker of Balanced Input in North Attleboro, MA. Burhans was impressed with the clarity of the system and the ease with which high quality audio could be achieved even though the performers were often dangerously close to the loudspeakers. Having heard Waker’s old Martin Audio W8LM rig at several events, Burhans became very interested in the newly announced WPM systems. Finalized at InfoComm 2018, Paddle Out’s purchase included 16 WPM and two iKON 81 amplifiers, eight CDD-LIVE 12 and four CSX-LIVE 118. 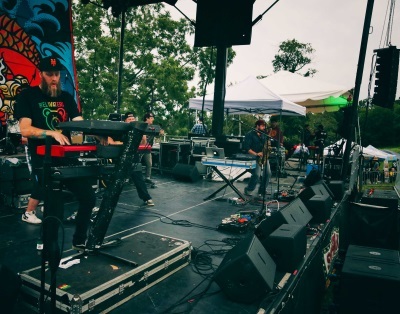 Five acts on the main stage could all be generally described as a mixture of Ska, Punk and Reggae, like the headliner, which simplified Burhans’ front of house mixing duties: “It made the day easier that they all sort of fit into the same input list in terms of horn sections and keyboards. The bass sounded great with the subs. “The system sounded great right out of the box,” adds Burhans. “We didn’t even get a soundcheck. Just did a line check––went right into the first band and it was all right there, crystal clear. That, plus getting it set up and flown the first time without a ton of walk-throughs made it a whole lot easier. We had the system up in the air and looking really clean in no time, which was helped by the software which is super user friendly. “Ultimately, I felt really at ease, even though I was starting a show without really hearing the system. I was putting it on display for my partner and the client, Badfish, as their main thing for this event and I was nervous at first but everything worked well with great coverage and sound. I mixed all day and I got more and more comfortable with the PA as we moved along and I dialed it in. The monitor engineer also had a great day–he said it sounded super smooth.